Joseph James Simpson was the eldest son of John and Matilda Simpson (nee Kennedy). James Simpson was the eldest of six children. He was born on the 9th October 1888 at Ballymully, Moneymore. His father was a farmer. He enlisted at Finner Camp, County Donegal with the 10th Royal Inniskilling Fusiliers. 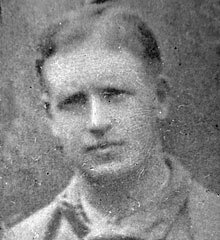 In the spring of 1918 the Battalion were disbanded and Private Simpson transferred to the 1st Battalion of the Royal Irish Fusiliers and was serving with them when he was killed in action on 16th August 1918. He was 29 years old. Joseph James Simpson was the eldest son of John and Matilda Simpson (nee Kennedy). John Simpson married Matilda Kennedy on 7th September 1888. James Simpson was the eldest of six children. He was born on the 9th October 1888 at Ballymully, Moneymore. The 1901 census lists James as age 13, living with the family in Ballymully, Moneymore. He was still at school. His father was a farmer. The 1911 census does not list James as living with the family. The family lived in Ballymully, Moneymore. Family: John Simpson, Lillie Simpson, Joseph James Simpson (born 9th October 1888), Arthur Simpson (born 22nd January 1890), Annie Simpson (born 17th April 1896), Maud Simpson (born 3rd June 1897), Thomas Simpson (born 4th August 1898), Edward John Simpson (born 19th April 1903). 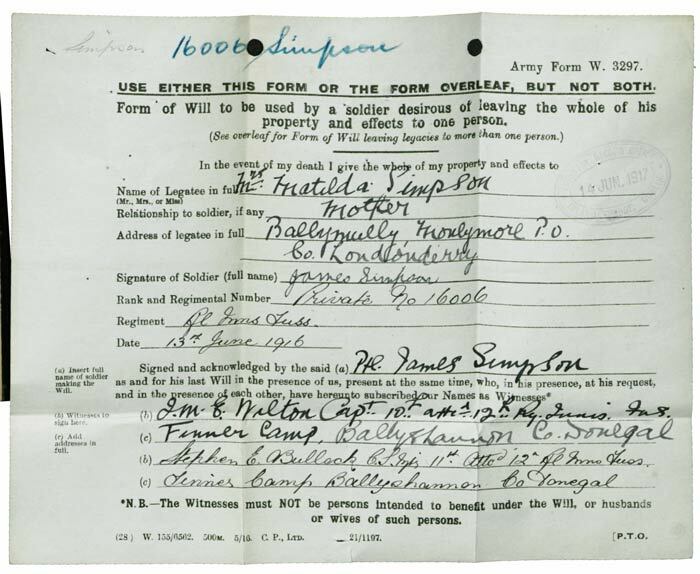 Joseph James Simpson enlisted at Finner Camp, County Donegal with the 10th Royal Inniskilling Fusiliers (Service No 16006). 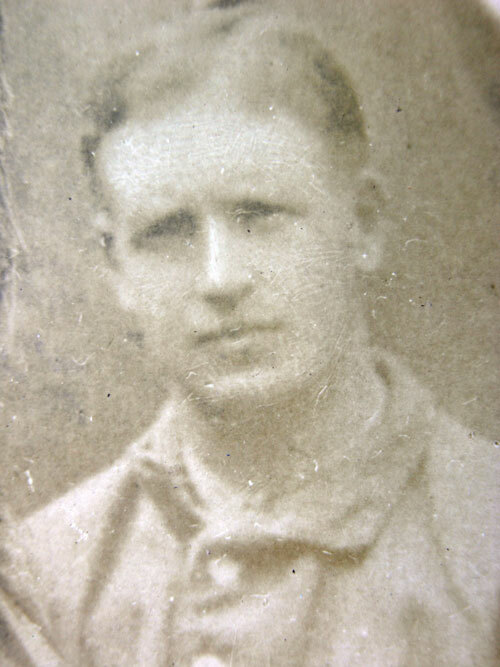 Private Joseph James Simpson served with them at the Battle of the Somme. In the spring of 1918 the 10th Battalion was disbanded and Private Simpson was transferred to the Royal Irish Fusiliers. Private Joseph James Simpson was serving with the 1st Battalion of the Royal Irish Fusiliers when he was killed in action in France on Friday 16th August 1918. In his Will, he left all to his mother, Matilda, who was living in Ballymully. In the event of my death, I leave the whole of my property and effects to Mrs Matilda Simpson, mother, Ballymully, Moneymore Post Office, County Londonderry. Signed James Simpson, Private No 16006. Royal Inniskilling Fusiliers. Private Joseph James Simpson is buried in plot 1- row D- grave 7 at Bertenacre Cemetery, France. In later years, his younger brother Edward would often recollect seeing his brother Joseph James leave home for the last time. ‘We walked to the train station at Moneymore, and had only gotten down the road a bit when he stopped and told me to go no further with him, as he wanted to take one last look at the old homestead.’ – Edward Simpson. Joseph James Simpson is commemorated on Moneymore War Memorial (Assembly Rooms) and on First Presbyterian Moneymore Roll of Honour. The CWGC record Private Joseph James Simpson as the son of Mrs Matilda Simpson, of Ballymully, Moneymore, Co. Derry. There is a Joseph Simpson listed as having attended Oldtown School. There is also a listing of the same Joseph Simpson, from the Oldtown, a member of Derryloran Parish Church, serving with the 3rd Battalion of the Inniskillings. This is thought to be a second Joseph Simpson, as Joseph James was a Presbyterian who at age 11 was still living in Ballymully, which is on the Desertmartin side of Moneymore.